Happy New Year! Are you guys back into the swing of things yet? For our family, getting back into a regular routine – getting up early, getting lunch and snack made and to school on time – has taken some extra strength and mind power from reserves that feel depleted. I feel like I’ve been doing a lot of rushing and catching up with very little downtime. Plus, getting into a cold car for the morning commute makes everyone just a little more tense and uncomfortable. Thankfully, there is a solution! Shortly before the holidays, Sirius XM’s Kids Place Live (ch. 78) started airing Kira Willey’s “Backseat Yoga Breaks” every morning on The Absolutely Mindy Show (7-10 am ET). These short breaks air sporadically throughout the show and offer everyone a chance to relax and get focused. Thankfully, our commute is long enough for us to enjoy these little breaks (which are also somehow nicely timed with the heat kicking in). Today I am so excited to deliver three NEW yoga breaks to you! These breaks are so easy and are presented in a fun way with language that kids will be able to relate to and even find playful. I especially love the idea of setting an intention and thinking positively about how we would like our day to go. Kira’s helpful prompts encourage thoughtful conversations, providing a nice pathway to connect with your kids. The car is usually so quiet in the morning as we listen to the radio and work on trying to wake up our faces. Listening to Kira’s gentle voice guide us through setting an intention has helped break the silence. It’s also given my daughter an opportunity to share what’s on her mind, and even seek advice on how to handle certain situations with friends at school. I love it! Feel free to enjoy these little breaks whenever you need them throughout your day. I use them on my own as well since I am on the computer all day and tend to hold tension in my shoulders and neck. Sit up tall, and bring your hands in front of you like bunny paws. Wiggle your bunny nose as you take quick little breaths in, (sniff, sniff, sniff!) and then let it all the way out. Once more, take some bunny breaths in (sniff, sniff, sniff!) and then let it all the way out. Do this a few more times if you like it! Bunny breaths give us energy, and can help us focus. Have a great day! Sit up tall, close your eyes, and imagine you’re outside on a warm day. Now imagine you’re a cloud in the sky. What kind of a cloud are you? Are you a fluffy white cloud, or a dark gray cloud? If you’re a storm cloud, you can let your angry raindrops just fall away. Maybe you’re a sparkly cloud, full of snowflakes. You can be any kind you want. Take a long breath in, let it all the way out, and open your eyes. Close your eyes, think about how you’d like your day to go, and finish this sentence in your mind… “Today, I’m going to be… ” Maybe you finish it with “helpful,” or “friendly!”…There are lots of things we have to do that we don’t have a choice about, but we do have a choice about how we act. So you decide how to finish the sentence, and if you want to, tell your grownup about it. And have a great day! Kira Willey is a nationally recognized musician and yoga teacher based in the Lehigh Valley of Pennsylvania. She is also the creator of Fireflies Musical Yoga for Kids. Kira is passionate about helping children learn relaxation techniques that also help strengthen their minds in a way that leads to better focus and concentration. 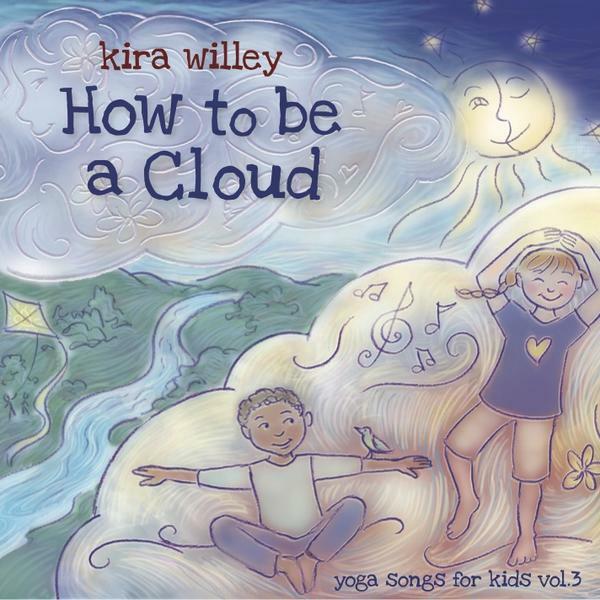 Kira’s latest release, How To Be A Cloud, contains a full set of 13 songs followed by 9 tracks featuring yoga instruction, and is packaged with a booklet illustrating yoga poses. Kira is also the host of a new yoga-for-kids series of interstitial programs airing on selected PBS TV affiliates which you can check out here. In September 2014, she led sessions with hundreds of teachers at the National Kids Yoga Conference in Washington DC. Check out the additional tension-relieving yoga breaks below and through this link. Also, make sure to visit Kira’s official page for news, music downloads and events. These backseat yoga breaks have become like apps for the body and mind. If you find yourself feeling anxious or in need of a brief reprieve, Kira’s got a yoga break for that. Need to reduce the tension in your shoulders, or perhaps, like me, you need a little assistance waking up your face? Kira’s got a yoga break for that, too! They truly are useful for all ages (see additional yoga breaks at the bottom of this post)! Sit up nice and tall, and close your eyes. Gently shake your head like you’re saying no, and then nod your head like you’re saying yes. Slowly and gently let your head fall to the right. Now, bring it down and forward toward your chest, and roll it to the left side. Lean your head back just a little, as if you’re looking up toward the sky, but keep your eyes closed. Now, let’s roll the other way: gently lean your head to the left, roll it down to the front, and lean your head to the right side. Come back to center, take a long breath in, let it all the way out, and open your eyes. Sit up tall, and pull your belly in. Squeeze your shoulders up toward your ears, take a big breath in, and let it out as you slowly drop your shoulders back down. Once more, squeeze your shoulders up toward your ears, take a breath in. Let it out as you slowly drop your shoulders back down. Do this a few more times if it feels good. Let’s wake up our bodies by squeezing all of our muscles. Start with scrunching up your toes, then squeeze all the muscles in your legs, make your belly really strong, and squeeze the muscles in your arms. Make your hands into fists, scrunch up your face and squeeze your eyes shut. Take a breath in, and as you let it out, slowly let all those muscles go, and relax your whole body. Wake Up Your Face <— YES, PLEASE! Kira is awesome! « Christmas, music and memories with Bob McGrath (Bob from Sesame Street!) – Part 1 of a 2-part interview.